Players have uncovered a game-breaking exploit in Street Fighter V which allows Blanka to essentially freeze time. Capcom is aware of the glitch and is working on a fix, while current tournaments have banned its use. But in the meantime, the fighting game community is having a great time with all the free wins – while continuing to enjoy all those Capcom soundtracks on Spotify, I imagine. Basically, the glitch requires you to cancel out of Blanka’s super by immediately inputting his forward hop move as the super starts. It’s precise, but easily reproducible, and it will freeze your opponent for a few seconds. During that time you’re free to attack, and since the super never actually comes out, it doesn’t consume meter – which means you can keep doing it over and over. The glitch was first discovered yesterday, which – as fate would have it – is Blanka’s birthday in Street Fighter lore. Capcom has issued a statement saying that “we are planning to fix this bug in the near future,” and Evo Japan, which starts this weekend, has preemptively banned the glitch. The Street Fighter subreddit is full of love for Blanka’s new position as lord above the tier list. You can see the exploit for yourself in action below. Oh, but it’s worth noting the exploit isn’t exactly foolproof, as pro player Xian unintentionally demonstrates on Twitch. There’s no ETA for that fix just yet, so make the most of it while you still can. 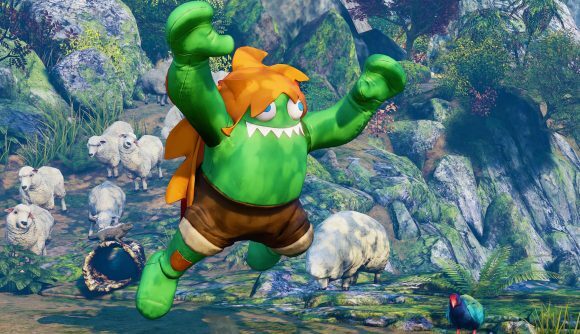 Between Monster Hunter: World, Resident Evil 2, and now the rebirth of Blanka, Capcom’s making a heck of a turnaround.